I have a difficult dog - How can I get a break? If there’s one thing Growly Dog owners know - it’s that sometimes you just need a break! However much you love your gorgeous darling reactive dog, it has the potential to become wearing. You don’t want your dog to become a burden! So taking a break, whether for work or pleasure, can let you see how the other half lives while reinforcing your good feelings for your dog - Absence makes the heart grow fonder, and all that. A change can also be a good thing, so holidaying with your pet is way up there on the to-do list for many reactive dog-owners. And it may not be as difficult as you think! As I have four dogs, holidays in hotels and b&b’s - though possible in theory - really were not fun. All this changed when I got a campervan and I’m now able to swan off with my dogs to all sorts of interesting places - beaches, forests, fields, moors - and enjoy the trip thoroughly. No campervan? You can rent one! 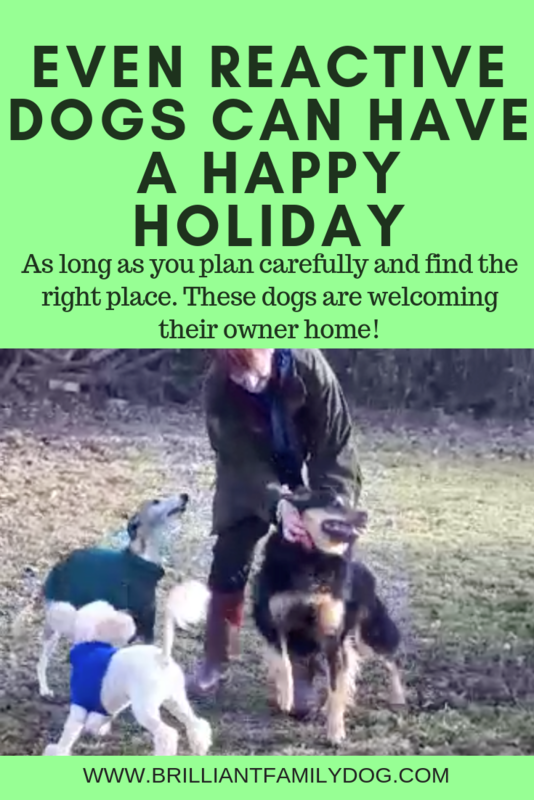 There are also many places - certainly in the UK - where you can rent a holiday cottage in the depths of the countryside, and dogs are welcome. They often have a well-fenced garden and ready access to walking country, though you’d need to check that first. For me that’s definitely the second-best thing to the van (well, first-best thing in the depths of winter! ), and I’ve been introduced to some great new places to explore that way. So holidaying with your dog, even a very reactive one, is definitely possible. And I know that lots of people set off with some misgivings, only to find that the whole family has a wonderful stress-free time - including, sometimes much to their surprise, their dog! What about when I can’t take my reactive dog? But what happens if you can’t take your dog with you and you have to travel? This was me recently, with a business trip. I was fortunate in that I know an amazing place where dogs - especially reactive dogs - are not just welcome, but thoroughly catered for and pampered. It’s not near me - I have to travel two hours to get there - but is it worth it? Heck, yes! The comfort I get from knowing my precious dogs are in safe hands, with someone who absolutely understands their needs, their individuality, their fears, is priceless. And, of course, this 5* treatment is not cheap. But how much value do you put on your dog’s safety and your own peace of mind? Now I know a safe place for them, I need have no qualms about future trips away from them. Previously I would only be away for a day. Then I’d get a carefully-chosen dog minder to visit them two or three times in the day. I didn’t want them walked, just given a break, let out, and played with. This works very well for me, but is limited to just the one day - and a minder who they’ve met and “approved”! So don’t let the fact that your dog does not strew rose petals and rainbows wherever she goes prevent you from taking a holiday - with or without her. The time to do your research is now, not five minutes before you want to go. You’ll have time to seek advice, check out the places, and carefully get to know the person who will be caring for your dogs. You’ll have some searching questions if you’re leaving your dog with someone else, and you need to get those questions answered thoroughly. In the case of the place my dogs stayed at, several visits beforehand are a part of the package, so your dog isn’t dumped in a strange place with strangers, and so that you can check out the carer and the premises. You can see the bond they developed with Clair in this video of the welcome they gave me on my return. They kept running back to her (with the camera) to tell her the exciting news! This is one of many videos and photos sent to me, most while I was away. Want some help with your Growly Dog?